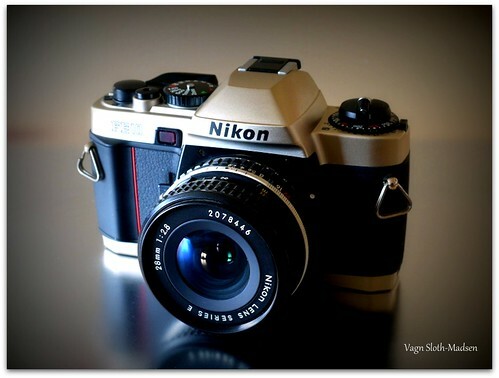 The Nikon FE10 is a manual focus 35mm film SLR released by Nikon in 1996. It accepts Nikon F-mount lenses. Advertising of the FE10 dwindled around 2003, and after 2006 only the FM10 remained as Nikon's lone "back to basics" manual-focus film model. The FE10 has aperture priority and manual exposure modes. It has an electronic metal focal-plane shutter with speeds from 8s to 1/2000 in A mode and 1 to 1/2000 plus B in manual mode. The hot shoe is compatible with Nikon Speedlights including SB-16B, SB-22, SB-23, and SB-27. A charged Speedlight signals the FE10's to sync at 1/90 sec. when the shutter dial is in auto mode. A charged flash signals the body to use 1/90 sec even when manual shutter settings of 1/125 or faster are selected; but 1/60 and slower may be used freely. The self-timer is electronic with a delay of 10 seconds. The FE10 features a TTL full-aperture, center-weighted metering system. There are 13 LED's in the finder indicating shutter speeds along with A, X90 and B lamps. Manual metering is possible using a match-LED system. The meter has a range of 1 to 18 EV at (ISO 100), and can be set to film speeds from 25 to 3200 ISO. Exposure compensation of ±2 EV as well as AE lock is available. Focus is aided by a split-image rangefinder spot surrounded by a micro-prism collar. The camera requires two 1.5 volt silver oxide SR44 or one CR-1/3N battery to function. The film transport uses a manual film advance lever and rewind crank. A full range of manual speeds from 1 to 1/2000 sec. These photographer-oriented differences may indicate Nikon had a greater influence than typical on Cosina's design. This page was last edited on 7 July 2015, at 04:25.